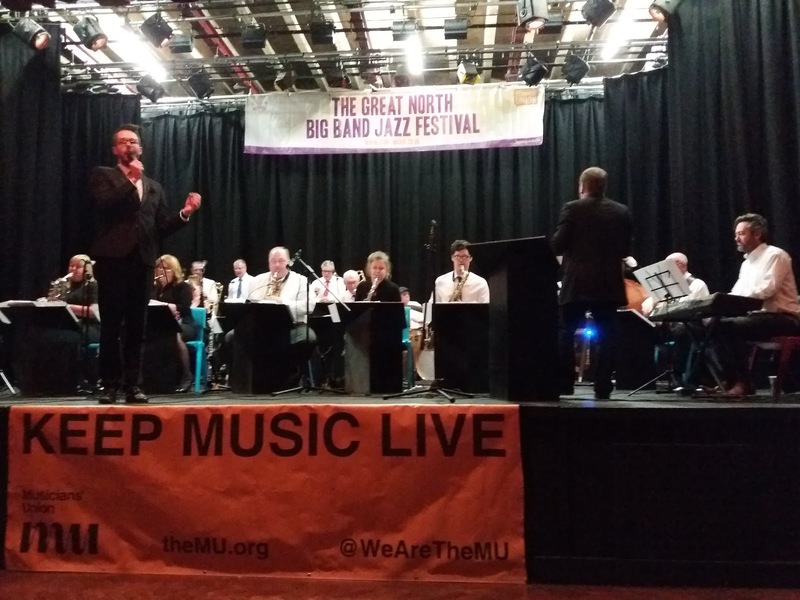 The sixteenth Great North Big Band Jazz Festival got off to a flyer...no snow! From Church Chare the venue - Park View Community Centre - was easily found thanks to a trail of strategically positioned arrowed signs proclaiming JAZZ! Friday evening is the non-competition day of a fantastic weekend of big band jazz. By tradition Hartlepool based Musicians Unlimited opened the show. Mick Donnelly's outfit hit the ground running with Ja- Da (comp. Bob Carleton) featuring first solos for Mark Toomey, alto, and evergreen Neville Hartley, trombone. There was much to get through in the band's one set performance. I Get a Kick Out of You introduced Paul Skerritt to the stage for the first time and, as usual, he gave a charismatic display with Sue Ferris announcing herself with the first of several knockout tenor solos. MU's other vocalist, Jan Specelayh followed and lost nothing by comparison singing My Heart Belongs to Daddy. 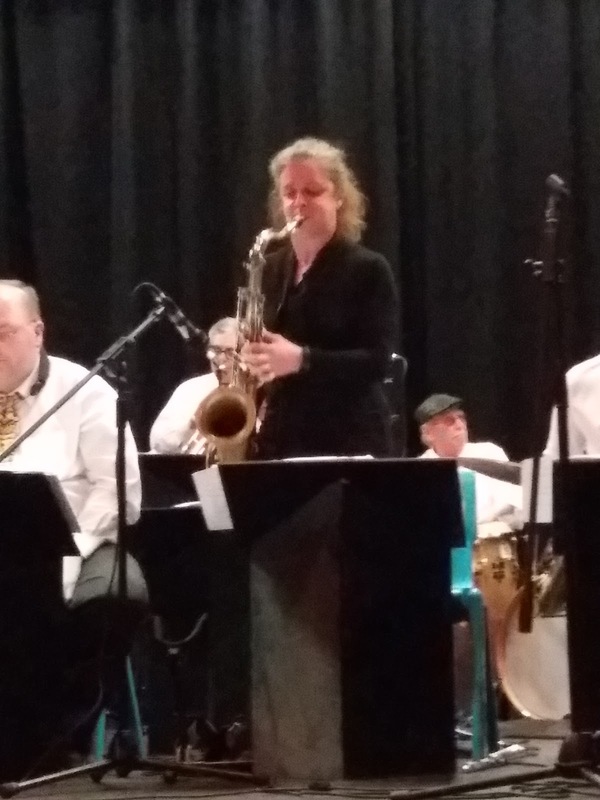 County Durham's Mick Shoulder switched from bull fiddle to bass guitar as the band went for it on High Maintenance with altoist Toomey once again in the spotlight as was festival director Bill Watson contributing from the trumpet section. Our vocalists shared duties - Skerritt returning to sing Georgia, My Baby Just Cares for Me and a non-ballad take on Misty, Spencelayh That Ole Devil Called Love and Don't Know Why. The band was given ample opportunity to show what it could do with Count Bubba a good example of ensemble playing at its best and Jim Martin's Semi-Mental Journey a feature for MD Donnelly on alto...it was as if to say: Hey, I too can play! Talking of being able to play...the orchestra's special guest, pianist Marcus Brown certainly could do just that! As Bill Watson pointed out Brown's resumé is quite something - as pianist, composer, arranger, Brown has worked with countless star names including James Morrison, Tina Turner, Richard Ashcroft and Madonna. He also finds time to score Hollywood movies! Musicians Unlimited, with Josh Bentham blowing tenor, went out on Sweet Georgia Brown. Earlier the Festival Band (with Marcus Brown, piano) directed by Bill Watson presented a programme of familiar and not so familiar big band charts. 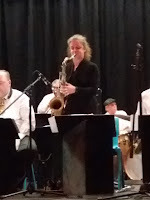 The sections were populated by some familiar faces - the rhythm section of Richard Brito, guitar, Mick Shoulder, double bass and drummer John Bradford to name but three - and some less familiar faces. MD Watson is steeped in the world of big bands and it came as little surprise that charts by the likes of Bill Ashton (NYJO) and Lennie Niehaus formed the nucleus of a fine set. Saturday's competitive action gets underway at eleven o'clock.